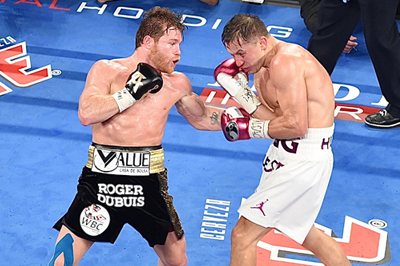 The decision rendered in the Canelo vs. GGG rematch wasn’t a robbery nor was it a travesty of justice. It was an extremely close fight that could have gone either way. For the record I scored the fight 115-113 Canelo. I had an excellent view of the fight from my press box perch and without the distractions of the PPV talking heads commentating on the fight I was able to come to my own unbiased opinion. It’s how I saw the fight. That being said, in the press box I was flanked on either side by journalists from Mexico. Sharing almost exactly the same perspective as I had it came as more than a surprise to me that less than a minute after the final bell rang both said they gave the fight to GGG. And so it goes. Looking at the social media reaction today and taking some very unofficial polls into consideration it looks like 2/3 of boxing fans think Golovkin won the fight. It was far from controversial but this decision will be argued for the rest of the year, or longer. In a nutshell here is what I saw on fight night; Canelo honored GGG’s pre-fight request not to run. It was a close nip and tuck battle but with Canelo being the aggressor it was hard not to give him rounds that were almost too close to call. It could be the judges felt the same. Looking over my notes, I wrote down in between rounds 5 and 6 that Golovkin looked to be breathing inordinately heavily which made me wonder if he had over-trained, i.e. left the fight in the gym. I still have reason to believe that may have very well been the case. Whatever the case may be Canelo was given 4 of the next 5 rounds by the judges and I too had it identically scored. Showing he has the heart of a champion Golovkin made quite a charge in the final four rounds splitting the tally on two judge’s cards while winning all rounds 9-12 on the card that eventually gave him the draw. Again, like the two judges who scored it for Canelo, I gave him the last round which was the one that secured his victory. The fight was close and truly could have gone either way. But with a house full of Mexican boxing fans cheering on every punch thrown by Canelo, even if they didn’t land, and a fighter in Golovkin who appeared to be laboring at times, I can understand how Canelo was given the close Majority Decision nod. Yes it was a good fight, quite possibly better than the first fight, but let’s get real for a moment here, you guys both promised KO’s but like the first fight you let this one go to the scorecards.…this was far from Hagler/Hearns or even Leonard/Hagler. Do we want to see it again? I think you can justify a Trilogy, but I do have some requests. First, can we build some anticipation here before you battle it out again? Suggestion…on the same night in a venue anywhere but Las Vegas why not have Canelo defend his title against Jaime Munguia and on the undercard let David Lemieux get another crack at Triple G? Let the chips fall where they may and guarantee the winners and the fans a date on Cinco De Mayo for all the marbles. I’m sure most odds makers would agree that Canelo and Triple G will prevail in those bouts. Personally I think that would create quite a buzz surrounding fight # 3. Sounds like a darn good idea to me. To recap, I think Canelo won the tightly contested battle and I understand there are those of you who think GGG deserved the victory. But the fact of the matter is Canelo left the building with all the belts and until further notice he is the man at 160 pounds. That fact is indisputable and undeniable. Look, I have zero problems with Munguia. He is a hard working big kid with a fan friendly style that could take him into some big money fights sooner rather than later. But the hype job that’s surrounding the kid is way over the top. I mean c’mon…Brendon Cook is far from a world beater. Let’s not get overly excited. 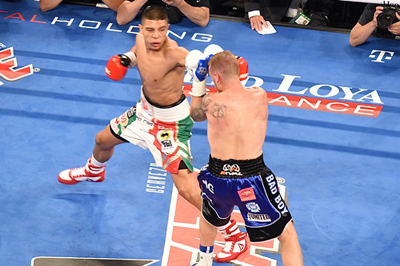 Munguia did what he was supposed to do with an opponent like this. Let the good times roll and throw him in there with Canelo. It’s a can’t lose situation for everyone. David Lemieux drilled Spike O’Sullivan into the canvas in prompt fashion. Talk about making someone eat their words. And speaking of eating, what did the meal consist of that had Lemieux balloon up to almost 180 pounds on fight night.Just the day before David weighed in at under 160 pounds. Good golly David is a huge Middleweight. He seems pretty confident right now…go ahead and give him that rematch with GGG. Yes, that was a devastating KO by Gonzalez on Saturday night but that was a shell of the fighter who once was 46-0 and was considered the Pound4Pound best in the biz. Credit to Roman for going over to his fallen foe and praying for him while he was unconscious. If anyone knows how scary that can be it’s Chocolatito who suffered the same fate a few fights back. Let’s hope he puts all that into perspective as he considers his next career move. Stay tuned to www.Pound4Pound.com for all the latest boxing news. This entry was posted on Monday, September 17th, 2018 at 6:58 am	and is filed under Boxing. You can follow any responses to this entry through the RSS 2.0 feed. Both comments and pings are currently closed.